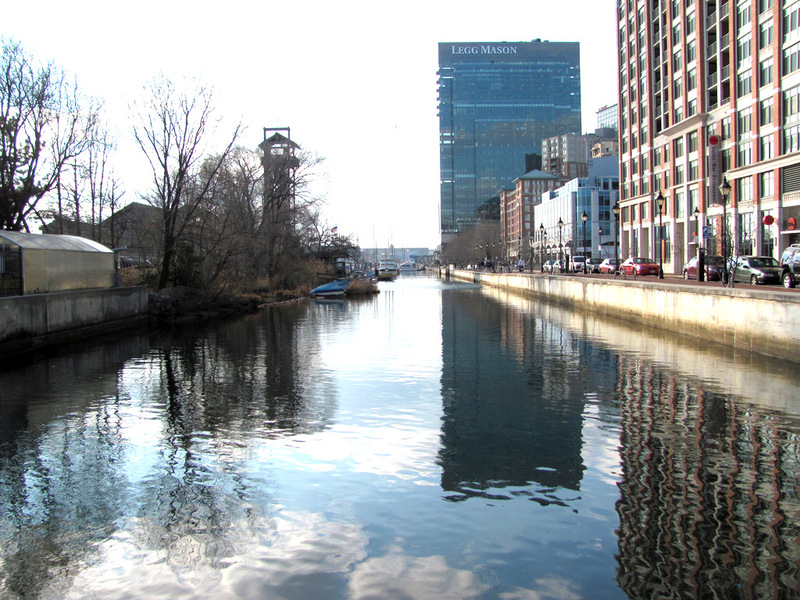 Above: City Dock canal now separates Harbor Point from Harbor East. A bridge over the canal at Central Ave. is being discussed as part of the Exelon project. Reporters were given a bundle of new details yesterday about the planned $120 million Exelon Corp. building – including the developer’s hope it will be 22 stories high and get a crunchy-green “platinum” LEED certification – but something subtler was being delivered as well. It was a tutorial on the development realpolitik of Baltimore from the chief emissary of the man who’s mastered the process, bakery magnate John S. Paterakis Sr.
“We are all connected. This project is downtown,” said Michael S. Beatty, president of Paterakis’ Harbor East Development Group. Calvin Butler of Exelon and Michael Beatty of Harbor East Development Group speak to reporters about Exelon’s new building. (Photo by Fern Shen). But his presentation was also a treatise on why Beatty and Paterakis think downtown has been foundering over the last decade, while Harbor East has been booming. “We’re going to go after those tenants that are leaving downtown Baltimore because they’re looking for this suburban dream of ‘Where’s my office park? Where’s my big floor-plated office building?’” Beatty said, as the panorama of Baltimore’s waterfront sparkled on the other side of floor-to-ceiling windows. 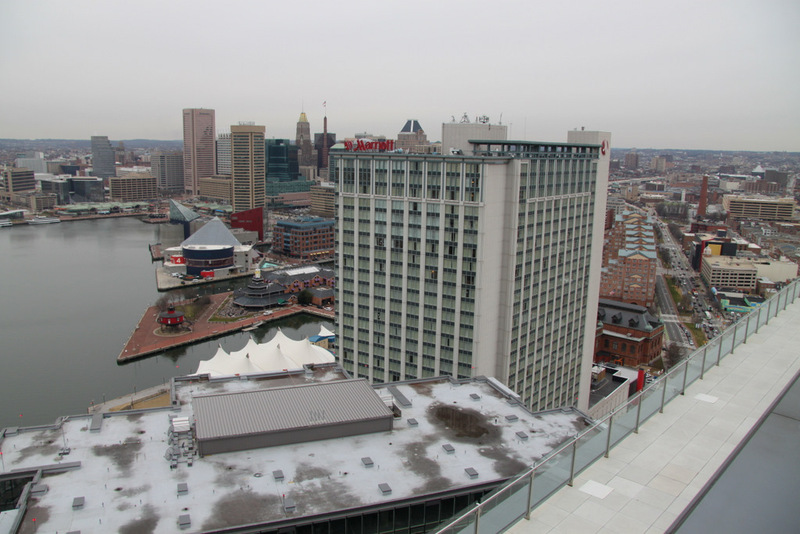 “The reality was, downtown Baltimore didn’t have the large floor-plated building,” he declared. No one piped up to note that there are three or four vacant sites in the “old” downtown where such a building could be constructed. “Tenants were looking out to the suburbs and saying it was safer out in the suburbs, and the reality was there was an impression downtown Baltimore wasn’t a safe environment,” Beatty said, as a representative for their latest trophy, the energy giant Exelon, stood by smiling. Nodding in agreement, Calvin G. Butler Jr., senior vice president for corporate affairs for Exelon, nevertheless insisted that the company’s site selection did represent its commitment to downtown Baltimore. But the two downtown finalists – the Baltimore City Community College site on Lombard St. and the former McCormick spice plant site on Light St. – didn’t cut it with the company. 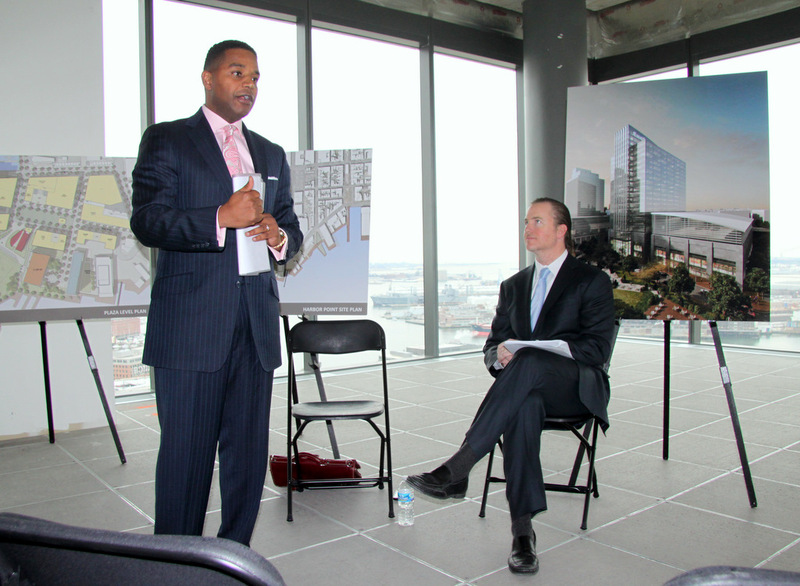 “We wanted to create a presence and make a statement,” Butler said of the Harbor Point site. Exelon is committed to paying $125 million for a 15- to 20-year lease on the building, he said. Moving to the new building will be the 2,000 employees from Constellation’s current buildings on Pratt Street and Market Place (on the eastern edge of downtown), as well as employees from Exelon’s energy marketing operation in Kennett Square, Pa., and its corporate headquarters in Chicago, Butler said. An artist’s rendering of the Exelon building released yesterday shows a glassy tower very similar to the Legg Mason building. Construction is planned to commence upon completion of Exelon’s $7.9 billion acquisition of Constellation, likely to take place at the end of March. “We are looking at occupancy by the end of 2014,” Butler said. Also on display behind Beatty and Butler were sketches of the 70,000 square-foot trading floor and schematics of the entire $250-million Harbor Point development. 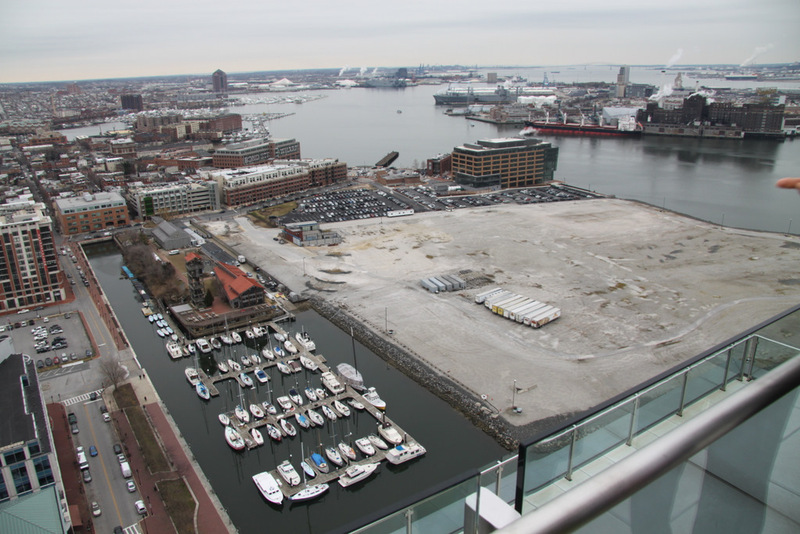 The mixed-use project (which already includes Thames Street Wharf and the Morgan Stanley building) is rising from a 27-acre brownfield site where the former Allied Chemical chromium plant once stood. 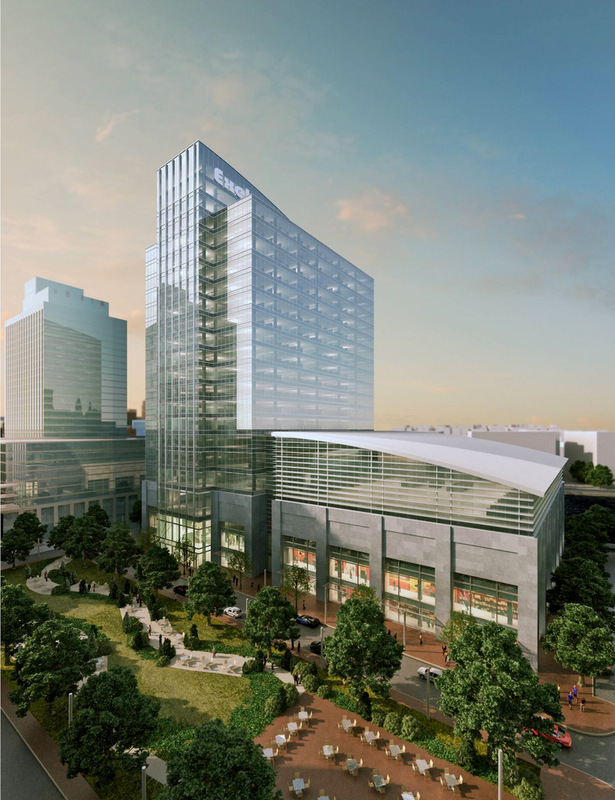 When fully built out, the developers said, Harbor Point will include a million square feet of office space, 150,000 square feet of retail, 600 residential units, 250 hotel rooms and 3,000 parking spaces. The Exelon relocation stirred up another hot-button issue in town along with the fate of the central business district – tax breaks. 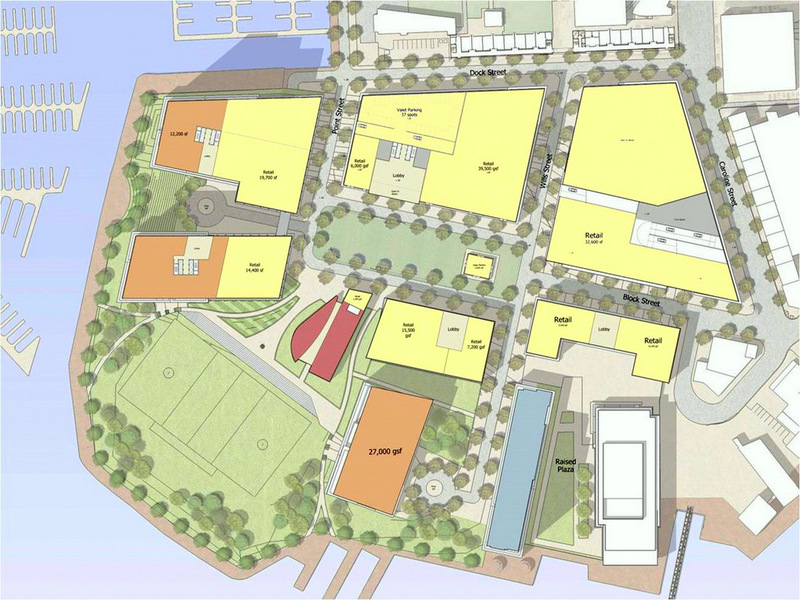 A key factor in developing Harbor Point will be the $155-million tax increment financing (TIF) subsidy approved by the City Council in December 2010. Moreover, the site is located in a state enterprise zone, entitling the developer to an 80% cut in property taxes for five years. Beatty answered some of the criticism by suggesting the subsidy was a good use of public funds in part because some of it was going to be used for open public spaces. The TIF financing, according to material the company released yesterday, would cover 2/3 of a mile of new roads and one mile of new sidewalks. The TIF also would also help finance 11 acres of open space, including a park and half-mile waterfront promenade, a central plaza, and a lacrosse field associated with a new U.S. Lacrosse complex on the site. Finally, the TIF would help pay for a new bridge that would connect Central Avenue to Harbor Point. The bridge would run past the west side of a current Living Classrooms building, said Marco E. Greenberg, Harbor East’s vice president for development, standing on an open terrace and pointing the spot out to reporters. 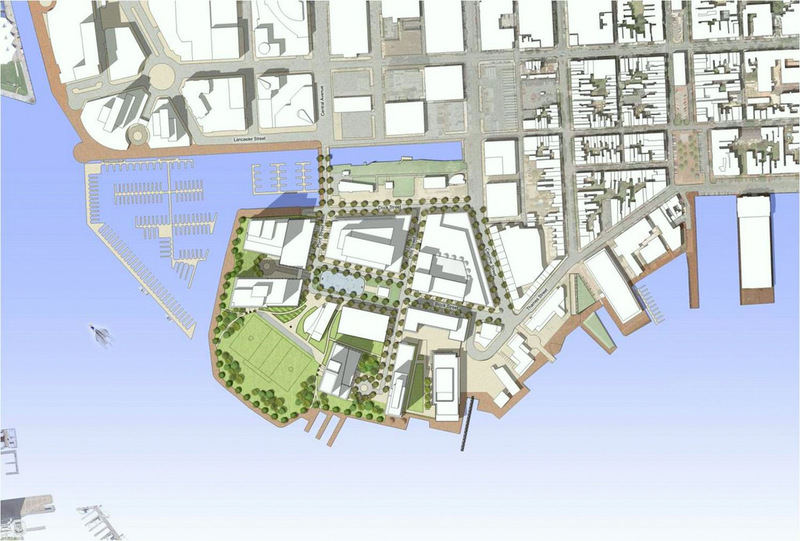 Harbor Point’s designation as a state enterprise zone would reduce the amount of property taxes going to the city of Baltimore to virtually nothing. That’s because the state’s partial reimbursement to the city for the enterprise zone break would go to pay off interest on the TIF bonds, not to the city’s coffers. The prospect of this double tax break at Harbor Point was the subject of some pointed words today at a meeting by a task force on tax breaks appointed by City Councilman Carl Stokes. Robert C. Embry, a former city housing commissioner and president of the Abell Foundation, expressed surprise that Harbor Point was part of a state enterprise zone. Wondering how “one of the most affluent areas of the city” got this designation, he speculated that it qualified as a disadvantaged area because it is located near one-time public-housing projects, long since razed, along Lombard Street. Embry asked “whether the city can get out of the enterprise zone” or when the designation expires. (The zones are enacted for a ten-year period.) Whenever that happens, Embry recommended that the city review the zone’s boundaries and economic justification. Noting that the energy giant reported profits of $600 million in the fourth quarter of 2011, Kraft said the company “ought to be saying, ‘We don’t need it,’” and should voluntarily agree not to apply for the enterprise tax incentives. Transit Friendly or Car Oriented? Another question raised about the Harbor Point project is whether it will essentially be a car-oriented development, much like Harbor East. “Definitely not,” Beatty told reporters yesterday. He noted that many of the occupants of Harbor East’s residential units don’t commute. He cited city bus service and the Charm City Circulator, and pointed to a stop on the proposed $2.2 billion East-West Red Line light rail as possible mass transit options. As for cars, he noted that Central Ave. is due for a $24-million makeover designed to relieve congestion that already plagues the area. Asked how many parking spaces the two developments will have, Beatty added up Harbor East’s current 4,000 spaces to Harbor Point’s proposed 3,000 and agreed that the development will feature 7,000 spaces. That makes for a very big office park. Mark Reutter contributed to this story. The FBI and IRS raid the home of Mayor Catherine Pugh, her lawyer’s office, City Hall and other locations.